Once upon a time, an expedition of Spanish conquistadores traveled to Nicaragua. These men were well-armed, for they were seeking to expand their empire, wishing to take over the people’s land. One day, they came to the lush and fertile Sebaco Valley, where two rivers crossed. There they met a tribe that greeted them warmly. The chief welcomed the conquerors, offering them deerskin pouches filled with gold. In this way the chief satisfied their greed. The men moved on to other parts of the country, leaving the people in peace. But before long, word of this tribe’s wealth and generosity spread to the people back home in Spain. The son of one of the conquistadores heard the story. He was studying to be a priest and decided he must go meet these people who had shown such goodness and generosity. And so he traveled to Sebaco. Again, the chief greeted the stranger with kindness and invited the man to his home to share a meal. There the chief’s daughter, a dark-eyed beauty called La Mocuana, met the stranger. From the moment she saw him, she fell in love. The two began to spend days together getting to know each other. As time passed, they fell more in love, and they spoke of marrying. The chief was not pleased with this union. “He is not the one for you,” the chief told La Mocuana. The man shook his head. “I wish you could prove that to me,” he said, and for a long time La Mocuana thought about his words. At last she decided what she must do. Her father had buried the tribe’s treasure deep in the valley. He told only La Mocuana where this burial spot was. And La Mocuana decided to take her beloved to this place and show him, to prove how much she loved and trusted him. La Mocuana could not imagine her life without her love. Late one night, she led him to the hiding place. The gold was buried deep in the side of a mountain, beside a dark cave. La Mocuana began to dig until she reached the first sign of gold. Her love smiled and kissed her, but as he stared at the bounty buried in the mountain, his heart began to turn dark. Greed took the place of love in his heart. He pulled her toward him and held her tightly in his arms. She gasped for breath as he lifted her and carried her into the cave. Inside, he tied her hands together. “I must leave you now,” he said, and without looking into her eyes, he ran away. He blocked the exit of the cave with boulders and mud, and hurried back to Spain, taking with him all the treasure. Inside that cave, La Mocuana screamed and wept with rage. She had never felt so betrayed. She wept with fury at her beloved and she wept with guilt for the betrayal she had shown her father and her tribe. She began to dig with ferocity. She worked for days until at last she managed to dig her way outside. Distraught, La Mocuana began to wander across the valley. 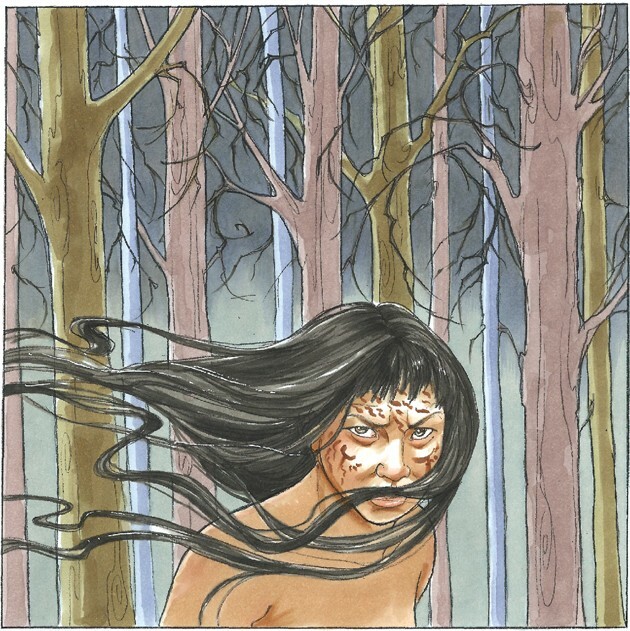 Sick with guilt and sorrow, she fled into the forest, and as she wandered, her thoughts began to drive her mad. People in that part of the world say they still see La Mocuana wandering. On dark nights, her sad figure sometimes appears, sneaking out of the darkness. She is still beautiful, and with her wiles, she lures men to follow her. No one ever sees them again.